The main golfing event of the year took place on the Old Course Elton Furze, (the only course). All the President’s Men assembled, no sign of Obama, didn’t make the cut I suppose. 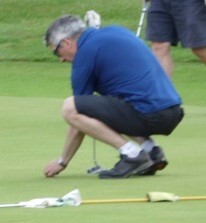 No Precedents were set from previous years, just this years hackers going out a fresh we rake bunker, there was loads of etiquette, dress code society shirts, apart from (Little) Richard who was still wearing his work clothes, & Colin (Compo) Savage’s odd socks, left a Nike and right a Wilson. Excitement started on the 8th when Les Wells trolley fell apart, then behind a tree with little back swing he managed to hit his broken trolley, shortly followed by a double hit in the green side bunker. Geoff L on the other hand had fun on the 9th trickling his third shot into the ditch, four shots later in the ditch he decide take the obvious drop, his next shot some how landed behind the hedge to his left a remarkable shot, it went forward about a foot but 25 yards to his left!!! followed by an underarm throw (maybe in frustration) on to the bridge 2 yards to his right, then the pick. 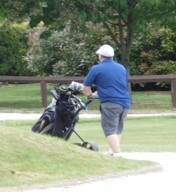 Les taking his broken trolley to his car. Colin S and Andrew withdrew from El Presidenti Cup early on in the bunker on the third failing to get out of it, it was the state of the bunker not the players, (so they said). 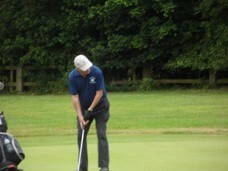 Roy got an 8 on both the 17th & 18th, nice way to finish Roy. The 7th was where their fun started, our loveable entrepreneur Colin K, a natural risk taker by trade decided to go for the green with his second shot, firing his ball straight into the farmers field he loaded another ball and did exactly the same. He was then loading up a third ball to follow the same route, however legal advice came from Geoff D (the Lawyer you can trust) suggesting a less ambitious shot would be a better option. 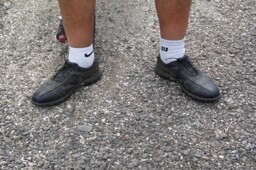 Martin in the group just said he did not play well, back to us in the photo below maybe in disgust!! 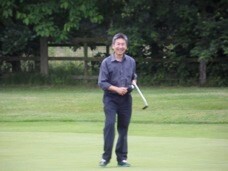 Fun started straight away with Colin H teeing off twice on the first and many other holes later (so he said). 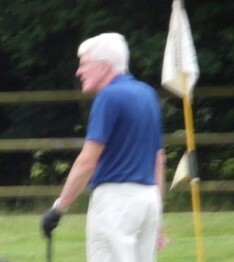 Richard disappeared into a ditch for a while somewhere, not sure where, or whether it was much to do with golf. 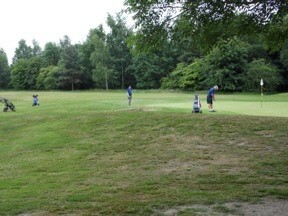 The four players had many trick shots (apparently) but only the EF members got members’ bounce off trees & over bunkers. 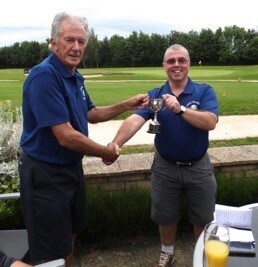 Won by Les with a net 70 Gross 88, trophy presented by Colin S last year’s winner. All four groups came in declaring no one had landed on the Green on the 2nd, then after a while someone said didn’t Brian get on the green. 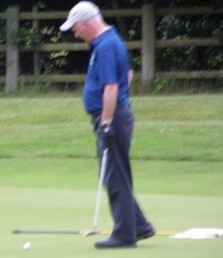 Brian then appeared from the club house and described how his ball managed to get over the pond, bobble around the bunker, and came to rest on the green, seemingly to his surprise. 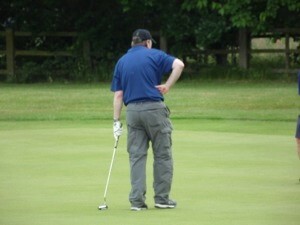 So Brian Bates won nearest to the pin.